Picking up where we left off a couple of posts ago, let us now look at the #11 to #15 spots of web-users’ “favourite“ Québécois. If you haven’t noticed already, athletes hold a prominent place in people’s minds when they think of their favorite personalities. But then again, that shouldn’t come as too much a surprise. Québec, like the rest of Canada, takes hockey, international titles, and its Olympians very seriously. Long-time, well-known reporter and international correspondent for Radio-Canada. 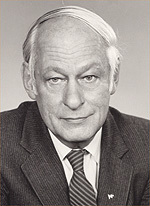 Was one of the main political figures in Québec during the 1970s, the constitutional rounds of the early 1980s, and was the main figure who brought Québec nationalism into Québec (and Canadian) politics. For most people, when they think of the politics of the end of the 1960s to the beginning of the 1980s, it is difficult to not think of René Levesque. Although he passed away in 1987, he is still held in high regard in people’s minds. His charismatic nature made him the “Jack Layton” of Québec’s nationalist politics – a personality which was difficult not to like (even for those who did not share his goals of Québec sovereignty). Anne Hébert can be credited as being one of the finest French fiction and poetry authors in Canada’s and Québec’s modern incubation age (a 50 year period which encompassed the mid 20th century). Because of her stature in such an era (one of only a handful of individuals), she played a hand in establishing and charting the National Film Board, Radio-Canada, and cementing literature as a desirable “home-grown” cultural institution in the minds of the public. Hébert won the Governor General’s Award three times. Kamouraska (compulsory school curriculum reading in Francophone schools across Canada). To show how appreciated she is across Canada, there is even a Francophone school in Vancouver, British Columbia named after her. Here are some examples of her poetry. Hockey Player (Montréal, born & lived). Three-time Stanley Cup winner with the New Jersey Devils. Two-time Olympic gold medalist in hockey. Multi-record holder (wins, losses, shutouts, games played). Hockey Player (Longueuil / Montréal). One of the other greats of NHL hockey history. Multi-record holder who played for the Montréal Canadiens for 20 years (until 1971). Known for having won more Stanley Cups than any other person. Best known in her historic role of Anne Boleyn in the 1969 classic film Anne of the Thousand Days. She’s still starting in roles today, and has become a living legend. (As an aside, Bujold played in the 1973 classic, Kamouraska, based on Anne Hébert’s novel, which I mentioned above). Here is a very nice interview with her in FRENCH on TFO (Ontario’s French public broadcaster). Here is an interview in ENGLISH regarding the same film you saw in the above clips. The next posts will continue to offer a list of web-users’ favorite Francophone Québécois & Québécoises. By Quebec Culture Blog 101 in Uncategorized on July 14, 2015 .